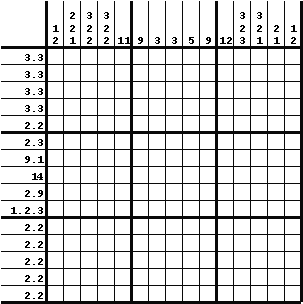 This entry was posted in Free sample puzzles, Picross and tagged griddlers, hanjie, IQ, pic-a-pix, solving technique, technique, UPDATE. Bookmark the permalink. Post a comment or leave a trackback: Trackback URL. And here I was hoping that I was smart by blowing right through the puzzle… Eh, comes with the territory. Keep up the good work!